Sir Timothy Thrapp teaches on “The Love of God, the Power of God” and our guest Brother Jonathan Gray shows amazing findings of earth’s history flying in the face of current rubbish taught the general public. And how does this relate to End times Solutions? What is our role in this? Should we store up food? Store up guns? What does God say we should be doing? It’s becoming well known among scientists that cell phone radiation causes cancer. WE HAVE THE WAY OUT AND WE ARE OFFERING IT TO YOU! As well as everyone! Exclusive breaking news. The expanding universe concept is completely proven false! Our awesome guest, back by popular demand, is international explorer, archaeologist, researcher and author, brother Jonathan Gray! He presented a mind blowing slide show. Did you know the ancient Chinese had a space program 500 years before Jesus lives on earth? In 500BC, the Chinese went to moon and even built structures there! Brother Jonathan will be sharing the conclusive evidence and also give tips on present day end times, survival and prospering. C: Praise GOD for that testimony! (of the guy healed of venereal disease) There are times I feel like I have no faith, but That Name of JESUS packs all the power! C: We have ALL been lied to , to take away the power God has given us. The dark side CANT take away the power given to us by God so the dark side trys to hide it from us by halftruth. Man may be week but the Glory of God in us is mighty, we just have to use it in his work. C: (regarding cell phones) I have to use ear buds with my cell phone, if I put to my head I get dizzy and very unbalanced. C: there are a number of common pharmaceuticals that are fluoride based. One can google “fluoride based pharmacudicals” for the list. Q: Question for SirT..Wireless router is 20 ft. away and carry a Queet in my billfold. Am I safe? 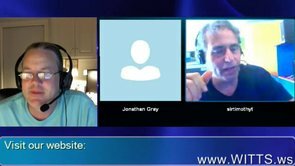 Q: for Jonathan Gray – What would you say is your most impactfull discovery found to date? Also, Can you validate Ron Wyatt’s discoveries, ie. Noah’s Ark, Ark of the covenant, Red Sea Crossing, Sodom and Gomorrah? Q: Can I use google earth to view China’s pyramids? Also, : so the energy top center of the pyramids are deadly but below bring a healthy environment? Q: For Brother Gray -From your uncovered information, how old would you say the earth is? Also, Do you have plans to write a more accurate history book that we could teach our children, so they can learn the truth about our past? Q: any close ups (pictures) of the Chinese structures on the moon? Q: could a pyramid help save bees that are under constant attack? Q: do we build our food storage pyramid out of plywood? Q: Do you have plans to write a more accurate history book that we could teach our children, so they can learn the truth about our past? C: Isaiah 33:15-16 He who walks righteously and speaks with sincerity, He who rejects unjust gain And shakes his hands so that they hold no bribe; He who stops his ears from hearing about bloodshed And shuts his eyes from looking upon evil; He will dwell on the heights, His refuge will be the [m]impregnable rock; His bread will be given him, His water will be sure. Q: regarding the Jerusalem Artichokes: do the roots grow deep or are they like sunflowers that grow shallow? C: According to Wikipedia Jerusalem artichokes have 650 mg potassium per 1 cup (150g) serving. They are also high in iron, and contain 10-12% of the US RDA of fiber, niacin, thiamine, phosphorus and copper. C: Chia seeds are another good one to store. C: Trust in God – good word! TRUST displaces fear. Amen brother Jonathan. Thank-you for sharing brother Jonathan! Q: Question for Sir T > Do not Witts Have plans for a Food system that recycle water to grow food and fish in a closed system that can be run by Dominant Energy? I believe these could be made portable. Could they be? Q: Can Jonathan Gray speak more about the particle that dissipates after 3 minutes of exposure that was found in the foundation stone? Q: what is the Johnathan Gray web site address? Q: re: Queet placement: I think most people try to relate how quantum devices work with other more-well-known technologies. If I understand it, they don’t follow the same ‘rules’ we ‘expect’ – it’s more about the environment, not exact locations or physical item… is that right? C: AWESOME! That is proof of the earth being very young and quickly being formed, not over a long span of time. SO AWESOME! Q: Has brother Jonathan Gray been to secret cities similar to those who Sir T have been to, if so how will the possible coming calamity impact those societies? C: Brother Johnathan, we would like to have you back on the show in a couple weeks on November 13th. We are holding the spot open for you. Q: Brother Jonathan, what is your opinion on who the “Sons of Gods” in the book of Genesis speak about? C: Wow… just like SirT said, our pastor emeritus was in a small twin airplane (on a missions trip) that flew for almost 2 hours on empty tanks… one engine quit, but they landed safely! \O/ God is GOOOOD! P.S. BUMPER STICKERS AND MINISTRY CALLING CARDS NOW AVAILABLE on GIFTs/ Perks Page. Many other wonderful gifts on the Gifts/Perks page. Please pray what God would have you do, Do it, Then request a gift. We love to bless you!